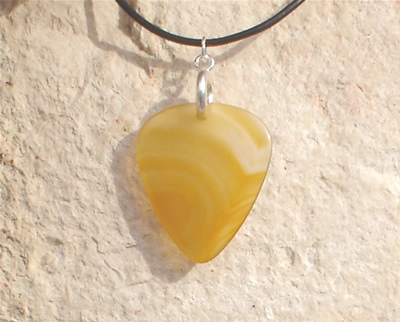 I am a guitarist and I want to make a necklace to decoratively display a guitar pick made of stone. My dilemma is accomplishing this while at the same time being able to easily remove the pick from the necklace quickly so I can use the pick to play guitar. I'd prefer playing with nothing attached to the pick when it is off the necklace because even a small clasp or attachment would interfere with holding the pick while playing guitar. I also want a reliable attachment since it will be holding a $35 agate pick. This photo I found online shows me proof that it can be done with a clasp of some sort but I am not sure how easy it is to get that pick on/off or how reliable that clasp is. Anyone have an idea of the size and type of clasp in the photo? The stone pick I am looking at for this project is smaller than in the picture but much thicker at about 2-3mm thick and has a 1.5mm hole drilled approximately 2mm from the edge of the stone (hope this helps) Maybe a lobster clasp or trigger clasp is not the best idea for what I want to do here? Infinity clasp? Or maybe a clasp is not the answer? Any advice on how to accomplish what I want to do would be greatly appreciated! The lobster clasp would be the only thing that would not leave anything on your pick. You put it through the hole and then you take it out of the hole. With other things the pick would need something on it at all times. If you get a small heavy strength magnetic piece, there would be another piece on the pick or something metal on the pick. It would be easier with a magnetic piece though. I hope this helps you decide on what to do. I am hoping that when I try to fit the different lobster clasps that one of them fits through the hole in the pick. I don't want to use anything that could pull apart since the pick would be of some value. The best way I have found to hang my player picks and keep it simple is to use a drill making a 2.5mm hole and hang them on 2.25mm ball chain. (dog tag chain). I make stone picks and my wife makes wire wrap baskets for them.